Botanical art is enjoying a renaissance, as the opening of the new £3m Shirley Sherwood Gallery of Botanical Art in Kew Gardens last month bears witness. Among the artists that Dr Sherwood admires, and whose work she collects, is Bryan Poole, an ebullient rugby-playinsg documentary-maker who trained as a botanical artist at Kew. He makes copperplate etchings, using the painstaking and meticulous intaglio ("in the cut") technique developed in Europe in the 16th century. Poole always shows his hand-coloured etchings at Chelsea and this year he has two pictures on display that are likely to cause something of a sensation. Each portrays the flower of a tropical heliconia species - just visible inside the enormous, gaudy, orange-red bracts - and the gorgeous purple-throated carib hummingbird (Eulampsis jugularis ). In one, the male bird is visiting Heliconia caribaea, in the other the female is buzzing round H. bihai. These pictures tell an amazing tale of co-evolution - or what scientists call "ecological causation of sexual dimorphism and co-adaptation". Dr John Kress, a botanist at the Smithsonian National Museum of Natural History in Washington, and his ornithologist colleague Ethan Temeles, have been studying the relationship between bird and plant for some years. They've discovered that the long, curving beak of the female hummingbird exactly fits the flower throats of Heliconia bihai - flowers that they both pollinate and feed from - while the males have shorter, straighter beaks that fit the flowers of H. caribaea. Dr Kress first met Bryan Poole when Shirley Sherwood included his pictures in an exhibition she was curating in Denver, Colorado. Last year Dr Kress asked him to make copperplate etchings of the extraordinary interaction between heliconia and hummingbird. Poole travelled with the botanist to Dominica, and tramped into the forest to make preliminary scale drawings and watercolour sketches. On his return, he visited the Natural History Museum, where he was able to observe Gould's stuffed hummingbirds. This was a relief, Poole says, since the Dominican montane forest is exceedingly damp. Moreover, these hummingbirds beat their wings 80 times a second and are "like little blurs". First, Poole makes a linear drawing with an etching needle on to a copper plate through a resin resist, which is impervious to acid. Next, he immerses the plate in ferric chloride acid, which bites into the metal wherever the resist has been removed. After that, he uses complex and time-consuming aquatint and "spit bite" aquatint techniques to give a tonal effect, rather similar to a wash drawing. (The same techniques were used by the artists Redouté and Goya, among others). Final highlights are achieved by burnishing back into the surface of the plate in order to expose the linear structure of the design. This results in a highly textured image of great depth and surprising vitality. Poole hand-colours the plate using a scrim or "poupée" dipped in seven different inks. It is then steel-faced, to protect the fine details from being worn away in the printing process. Finally, he puts the plate on to the bed of a 19th-century Rochat intaglio press, places moistened, acid-free paper on top of it, then turns a wheel (a task that requires all his physical strength) to press down on the paper. When dry, the print is hand-finished, using watercolours. For me, the most remarkable aspect of intaglio is that the copperplate is etched back to front; Poole must therefore have an exact mental image of the finished picture before he even begins. The prints are limited to 100; after that, even a steel-faced plate will lose its sharpness. What makes these pictures particularly wonderful is that, as well as being artful in design and rich in colour, they are scientifically accurate. The differences in flower structure of the two heliconias are as clear to see as those in the shape and length of the hummingbirds' beaks. The design of the leaves, stems and flowers draws the eye through the two-dimensional image so that it acquires tremendous depth. It was in July 1858 that Charles Darwin and Alfred Wallace revealed their theories on natural selection to the Linnaean Society of London. On Darwin's visit to the Galapagos Islands, he studied ground finch species, which had evolved with diverse beaks depending on the food available. These came to be known as Darwin's Finches. 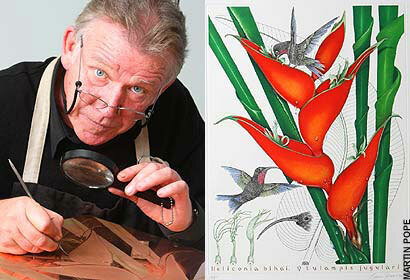 Thanks to Bryan Poole, exactly 150 years later, Darwin's Hummingbirds will be on show on Eastern Avenue (EA5).